Palomino Blackwing Pearl. Even though this beauty is surely a fantastic pencil, I find myself reaching for other pencils over it. At only $1.66 a pencil it’s not even my most expensive pencil, but I find myself putting these babies on a pedastal. OF course, because I think too much about such things, I have to wonder, should it be up here? Am I allowing myself to be corrupted by hype? Or do I really just LURVE the slightly opalescent white paint? Is it that I can cut myself a chunk of Staedtler Mars to fit into the eraser? The Musgrave Test Scoring 100 This is almost even in my top 5 pencils with the Pearl. I like the thin silver finish. I like the core and how it works. It’s dark and smooth and for a dark pencil it holds its point well. For taking notes in my classes it can’t be beat. I’ve ordered another bunch of them, and never want to be without one in my EDC. Tombow 8900. I love these olive drab pencils. Their finish is nice, the imprint is gold foil and they lack an eraser or a finished end. Though for writing they remind me of drawing pencils. Inside the core is dark and smoooooth. The point retention is great for such a dark and smooth pencil. Also great for taking notes or for sketching. Ticonderoga. I have a Ticonderoga in some form in my EDC every day. Lately I’ve been using a EnviroStik WOOD. Apparently they change these up and have them made out of different recycled things. Luckily I snagged the recycled wood slat option. Oh baby. These are intensely fragrant when sharpened, the cedar hist my face like a sledgehammer. The core is mostly smooth with occasional gritty bits. What is really great about the EnviroStik is that even though it’s a nice dark pencil it has great point retention. When sharpened with the Carl A5 sharpener the point could last for pages and pages. It’s pretty amazing. It’s also a great pencil for taking notes while reading or doodling in class. 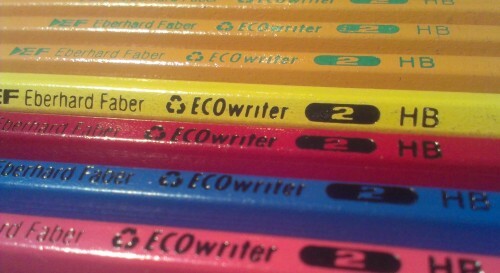 Vintage Eberhard Faber ECOwriter. This is neither a premium pencil nor one that most people will like but this is the pencil that got me hooked on pencils. This is the pencil that I searched for everywhere when I couldn’t find them easily. This is another pencil that PaperHate turned into a horrible pencil. It’s a pressed sawdust pencil that has a nice smooth dark core. Point retention is great while taking notes or sketching. No longer in production anywhere I went to the great eBay and bought myself 72 after a friend sent me a baker’s dozen. Just an awesome pencil. As you can see there has been a lot of change in my pencil use since the last time I wrote the Top 5. Dropping off the list is teh Uni Nano Dia, Tombow Ippo, USA Gold Natural, and Wopex. I still use these pencils they just aren’t what I’m reaching for while I’m taking notes in class or while reading. Some of the paper in my text books really doesn’t like the Wopex and I find myself reaching for the 8900 over the Ippo for it’s softer smoother core. At the same time while I’m in class taking notes I’m looking for pencils like the TS100 that holds it’s point better than the Pearl but still lays down a dark line without scratchiness.